I can’t find the power cable for my video camera. And I used the last of the battery to record us playing How He Loves Us for Stephen 2 weeks ago. So here goes another one in text. Week 2 of Advent Conspiracy. I was petty stoked about a creative element we added this past week. We talked about advertising and the stock that it holds in todays consumeristic culture. 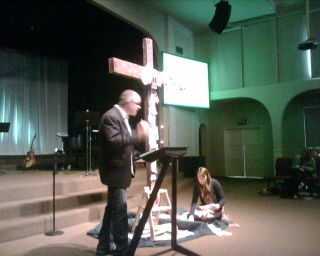 During the message, Rae Albrecht covered the cross with a collage of advertisements. We pointed out that this is what our culture has done at Christmas, covered the cross of Jesus with consumerism and advertisements. During the worship time after the message, we invited people to respond y removing the ads from the cross as a commitment to uncover the cross during this advent season. It went really well and there were lots of people who responded that I don’t typically see get out of their seat to respond. As much as I loved the idea, I shared with Chris Gott right before we got going that I was a bit nervous to see how some people would respond to the ads on the cross. He said anytime that multiple people die on Black Friday, all bets are off. It’s time for people to be shocked into reality a bit. Well put. This post is also part of Sunday Setlists at Fred’s blog. Stop by to see what other worship leaders were up to this week as well. Great setlist! Our worship team hasn’t done any christmas songs yet but we will soon. Love the idea of the ads on the Cross!